Not very heavily, to be fair, but it's still snow! It was lovely here yesterdya, as it has been for most of last week - blue sky, sun, usual breeze, but warm out of it. Dan and I had yesterday in the garden - very busy (what we did will be another post) and today - snow! And we planted out lettuce yesterday! Hey ho, I'm off to spring clean Lorna's bedroom and maybe the front hall, if the snow stays on. Talk to them all the time. Pigs respond well to voice, so if you use a consistent call with them before feeding they will learn to come when you use that call. Rosemary uses a slightly high-pitched 'pig-pig-pig' to call them. Feed them around you. We feed our pigs on the ground by simply scattering their nuts - if you scatter them around yourself and crouch or stand still the pigs' desire to reach their food will trump their nervousness of your presence every time. This is a great opportunity to get a hand on their back or head so they can learn how nice it is to be scratched. Scratch them. Pigs love to be scratched - start with the back of the head and the back. If you work around to under their bellies they will topple over and just lie on their sides. Feed them treats. We hand-feed them apple slices (see vid below, apologies for the wind on the sound again, it is very windy here!) which they love. Tamworth weaners getting apples from The Accidental Smallholder on Vimeo. Caledonian Marts in Stirling hosted the Central Scotland Poultry Sale today. I went along, armed with cheque book, puppy cage and cat basket (just in case). There seemed to be a good turnout, but the first person I saw was Jo Lennon, who's a founder member of the FV&WF Smallholders' Association! I had arranged to meet Andrew and Janis Sharpe, who were "just there for a look". Hold that thought! There were about 200 lots, including hens, cockereles in singles, pairs and trios; ducks, geese, a few turkeys and two pea fowl. Well, the new Black Rocks seem to have survived the trauma of the poultry sale. We cobbled together a temporary run for them today round about their house - the fixed run is way too small and is difficult to move. One BR flew over the fence but we caught her and put her back - to be hinest, it's not a big deal and they will be free-ranging in a few days anyway, once I'm sure they know where home is. Our other hens seem completely unimpressed - even when the escapee joined them. Felix, Circus Cat from The Accidental Smallholder on Vimeo. 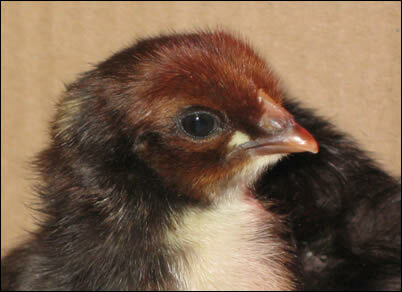 Our French Copper Black Marans are due to hatch today. Two were pipping last night when I went to bed; by this morning at 6am niether had made much progress so I reluctantly decided to give them a hand. Armed with warm water and some damp kitchen roll, I started to remove some of the shell. I would have stopped if there had been any bleeding from the membrane, but both were OK. There are now two little chicks drying off in the incubator. I'll move them to the brooder later. I'm not sure if there are any more coming - two out of 10 would be a bit disappointing. I bought 12 off Ebay; the incubator only takes 10 (who designed an incubator for 10 eggs, I ask you); Dan candled them last week and discarded three as definitely being empty and he was not sure about the rest. So two is better than he expected! We'll be keeping any hens and one cockerel for the flock. Seven hours later, the first two chicks are in the brooder, a further three have hatched successfully and are drying off in the incubator and one is pipping. Only one is showing no activity yet. I'd take some photos but Dan's taken the camera to London. Now what can there be in London that justifies a camera more than my cheeps? Just off to move the three to the brooder! I bought the local rags today (as I do every week); both had double page articles about the re-opening of the Alloa-Stirling railway in May. This is a huge project for Clackmannanshire - the railway to Alloa closed about 40 years ago (I vaguely remember it) - and is seen a a major factor in the ongoing regeneration of this area. The first trains will run, courtesy of the Scottish Railway Preservation Society, on the 15th May. There will be two trains that afternoon making the journey to Stirlinga nd back. The outward train will be pulled by a steam locomotive, "The Great Marquess" and the return journey will be hauled by a Deltic diesel "Royal Scots Grey". Read more on The trains are coming! We had our first egg from the new Black Rocks we bought last Saturday. There were two but one was squished. The eight new girls are now free-ranging, but don't really mix with the existing hens except at corn time. The new girls don't quite recognise the "call to corn" yet, but they are learning fast. One of the "old" BR may defect to the new flock, I think - birds of a feather and all that. We've sort of put in a pond - well, it's in but not filled or planted up yet (maybe this weekend!). That hasn't stopped Mr Toad moving in, though. We first saw him a couple of weeks ago - we thought he was dead but I think he was just cold. However, I caught him sunbathing the other day. He's not handsome, but I rather like him. Just hope he manages to stay clear of the destructo-hens! Well, quite a lot, really. The weather has been really dry - cold and sunny and very windy. We've got all our potatoes in - Red Duke of York and Desiree, and Mayan Gold, because I'm a sucker for marketing. We've a few seed potatoes left, but we might find a home for them yet. Garlic, shallots (Longor and Mikor) and onions (Hercules) are all in, along with a couple of rows of spring onions (White Lisbon) that Dan found lurking in the shed. Leeks (Bandit and Hannibal) are outside in a tray and will be planted out when they are pencil sized. It's a rotten tray (an old cat litter tray) that they are in with no drainage (but it's nice and deep) so we have to keep an eye out for both drought and waterlogging, which is what happened last year and we had no leeks at all. Read more on What's happening in the vegetable garden? Of our six cheeps, I'm pretty sure we've got two cockerels and four hens. Two of the cheeps are bigger than the other four and have real coppertops. 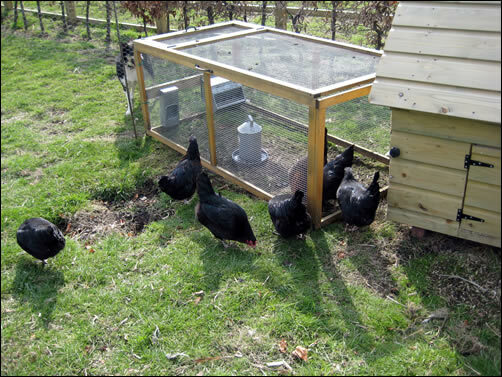 I've had alook at some photos of adult birds, and the hens are black, with the cockerels having the copper head and collar. I think we'll keep two hens and one cockerel and sell a trio, once they get (much) bigger. There was a time when the best present Dan could buy me was a chocolate bar but no more! (Actually, chocolate is also welcome anytime). Today, 6 Cream Legbar eggs arrived in the post. They are the most lovely colour and if Dan hadn't taken the camera to London (again), I'd have taken a photograph of them. They have now been "resting" for about 12 hours so I'm just going to pop them in the incubator.